Imagine feeling alone in a crowd, preferring a quiet corner to the limelight and feeling overwhelmed by phones, parties and office meetings. Do people often think you are shy, aloof or antisocial? If you are an introvert, you are going to completely relate to a variety of comments that are like fireworks going off in recognition of truth. Introverts can hide their talents and only show them in certain situations. Through reading this wonderful and often humorous book, you will be assured that nothing is wrong with you. In fact, there is a connection between Introversion and Intelligence. What is fascinating is how Marti Olsen Laney explains how introverts create energy in the opposite way extroverts do. I’m often drained of all energy after being with people for extended periods of time, but being with a book can set me on fire with creativity and energy. I can handle small groups and connecting with familiar faces can actually energize me, but after three hours, I want to find a more peaceful setting. This book helped me understand why I have deeper thoughts when I’m by myself than in a group setting. People seem to not know who I am in the “real-world,” but online, I have found a place to show my true self. This is apparently because introverts are more comfortable with writing than speaking in public. Are you detail oriented yet details in public spaces overwhelm you? Do you prefer small parties with intimate friends? Do you avoid crowds? Would you rather be reading books in bed in your pajamas? Do you get tired when you are around people, but energized when alone? Do you feel guilty about having to “limit” your social experiences so you can survive? Does your mind sometimes go blank in group situations? Do you dislike being interrupted in the middle of a project? The author has divided her comments into three main sections. First you find out if you really are an introvert, then you discover how to navigate the extrovert world. The last section explains how you can create the perfect life by “extroverting.” This is just another way of saying that an introvert can also shine their light out into the world. After reading the list of famous introverts, you will see similarities in their personalities. The author also gives a list of movies to add to your “must-see” list. Marti also spends time seeking the in-depth answers to brain chemistry. You will also find out if you are a Right or Left-Brained Introvert. Then onward to “dating.” The “Relationships: Face the Music and Dance” chapter shows how personality types collide, how to meet the challenge and then how to appreciate the differences. Even by reading the chapter on Parenting, I started to understand extroverts in a new way. I find extroverts to be fascinating, yet at times they overwhelm my cozy-sit-in-the-corner cat nature with their tiger tactics. Extroverts just seem so aggressive at times. The world can look a little threatening and a party can be overwhelming. I love the author’s ideas about how to be a sea anemone at a party. I’ve survived many parties with this tactic. If you are worried about what to say at a party, Marti gives plenty of solutions in the form of openers, sustainers, transitions and closers. Then she dives into the hazards from 9 to 5. This chapter will also shed some light on your personal relationships. Ok, by the time I read “Pack Your Survival Kit” this book had been more than helpful. These tips alone will encourage you to create a more peaceful planet. “The Introvert Advantage” is an encouraging book for anyone who has felt the pain of being an introvert in an extrovert world. Marti Olsen Laney also shows how it can be equally painful and unfulfilling to remain in a state of seclusion. Through reading thoughtful segments on a daily basis, you can finally start to find balance in your daily existence. This is a must-read book for all Introverts and the people who love them. The author has a comfortable writing style and you will feel “at home” and find yourself “completely” relating to her experiences. It is rare to find a book where you just fall in love with an author’s personality. She is cute, witty and intellectual too. Finally someone out there understands! The author has really done her research. Highly recommended. Add this book to your Top Ten must-read books this year. After all, it will help you understand 25% of the population. ~The Rebecca Review.com, A Right-Brained “mostly” Introvert (INFP) and proud of it. 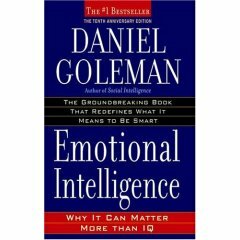 Of all the books I have read in my entire life, Daniel Goleman's book on Emotional Intelligence was as difficult to begin as it was to put down. After numerous attempts to make it past the first chapter, I finally dedicated an entire week to the reading of this classic treatise on the importance of emotional awareness. Surprisingly it then only took three days to finish reading because I read constantly day and night, night and day. The rare beauty of Daniel Goleman's writing is breathlessly intellectual all while retaining a centered approach to the research of his topic at hand. Not only has he brilliantly woven carefully placed threads of awareness into a coherent and comforting blanket of understanding, he uncovers truly helpful and practical applications. From a deep ocean of emotional conflicts and social programming, ideas for healing appeal to our hunger for inner coherence. His work also explains why we long for positive nourishment in a negative world and why a range of skills beyond basic IQ serves to enable our success. Daniel Goleman's writing is rich and intricate. He draws on a variety of well-known experts and personal interviews he conducted for The New York Times. His extensive interest in this topic reveals itself in the fluidity with which he combines the information so as to make it completely accessible to anyone willing to take the time to follow his logic page by page. He explores the disintegration of civility, biological patterns of emotional response and shows how the rational and emotional minds can work in harmony. Practical elements include an understanding of feelings as they happen, how to manage emotions and how to handle emotions as they arise. Throughout, Daniel Goleman gives hope and explains why "lapses in emotional skills can be remedied." Anyone who deals with anger or depression will be especially encouraged while reading this book. All too often we learn by experience and this book is filled with a variety of pathways stemming from emotions that either lead us to peace or conflict. Even while reading this book, you may be triggered numerous times and feel a wide variety of emotions. I was happy to read about how crying can "lower levels of brain chemicals that prime distress." Many of the topics in this book help to explain why our emotions create various responses and how we can adapt, immediately address the problems or move from one emotional state to another quite quickly with very minimal effort. Even while reading I could feel my emotional state in a constant flux due to various topics bringing memories into my awareness. There are at least three ideas I'm already putting into practice and reading books to distract myself from negative emotions definitely works to change moods dramatically, as does exercise. You may find yourself underlining entire passages and then finally just circling an entire page to refer back to in moments of reflection. What does it mean when someone lacks empathy? What are the early warning signs of divorce? Why can neglect be more damaging than abuse? Why is the ability to control impulse the base of will and character? The reasons for addiction, epidemic depression and rage are all addressed from a scientific perspective while at the same time taking practical matters into account. Why do emotional impulses so often supersede rational thought processes? If you enjoy reading books on psychology, love, interpersonal relationships or communication, this is essential reading. Reading this book could be as essential to your success as a college education. In the end, I think you can't truly be happy unless you find at least "one" person who really listens to your heart. Once you know what your heart is telling you and you find a place where your desires don't conflict with your rational mind, peace may begin to appear for moments at a time. Specific religious beliefs are not taken into consideration due to the all-encompassing nature of this book. However, once you read this book in all its beauty, everything you believe will make more sense. Keeping a handle on your emotions then gives you more control over your self-esteem, which in turn can keep you alive. Reading a book on emotions may be essential to your survival for to understand this aspect of life is truly enlightening. I would not have been able to understand this book in my 20s, but I definitely have enjoyed finding it before I turn 40. I feel like entire worlds will open up as I read additional selections. This is a true basis for understanding the desires of the heart and how we can temper passion with rational thought. P.S. If you enjoy this book you may also enjoy "Conversations with the Conscience" by Sarkis Joseph Khoury. It is a very personal account of one man's journey through the rational and emotional mind and it has a very deep spiritual appeal that has universal significance. These two books have truly helped me understand life in all its conflict and beauty. I first came across the idea of being an introvert when I read "Introvert Advantage." I finally felt understood on a deep level. So it is with some excitement that I started reading "Quiet." Susan Cain explains that one out of two or three Americans is actually an introvert even though we see ourselves as a country of extroverts. As an introvert herself she is very brave and while researching this book put herself in many situations which would stress out an introvert to no end. Like she attends a Tony Robbins seminar and interviews students at Harvard Business School. She also gives speeches and talks to famous people. As an Introvert I could really relate to many of the topics discussed. Like for instance Susan Cain explains how extroverts get better grades during elementary school but introverts get better grades in college. I found that by master's school I was finally getting the grades I felt I deserved all along. The contrast between my school grades and college grades was shocking. I had almost failed everything in high school but had a 3.9 GPA by the time I was done with master's school. It was amazing the college I went to gave me a chance. What is the real reason Americans become obsessed with movie stars? If solitude is good for the soul will it also make you more successful? Why is there reduced productivity in open-plan offices? Does noise improve your thinking or is it too distracting? It was interesting to read that Bill Gates is an introvert. So introverts really can change the world. They just have to stick with what they are good at and success will follow. Part of this book does encourage you to act like an extrovert some of the time. Like if you go to a party you may have to come out of your shell a little. If parties are a big deal to you and you hate them read The Introvert Advantage: How to Thrive in an Extrovert World for coping strategies. If you are a parent who has children who are introverts there is also an interesting chapter on how to raise children so they can handle playground politics. Overall I felt this book was extremely well researched. The author keeps to the same style most of the time generally telling a story and then analyzing it. Because each chapter is so rich with details it might be advisable to read one chapter a day. 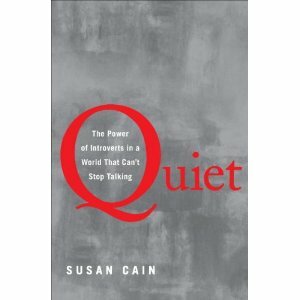 If you are an introvert this should be on your must-read list! As of today I've written 4,201 reviews but my husband calls me slow when I walk. He is an extrovert! Obviously I do things faster when sitting.